You can use drug store calcium supplements (such as Caltrate tablets) for buffering, but calcium carbonate (CaCO3) is cheaper at the garden center. 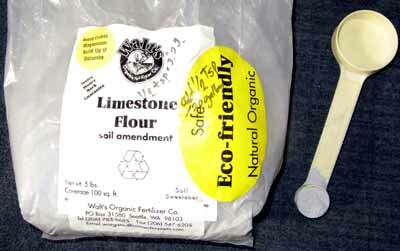 This 5-pound (2 kg) bag of "Limestone Flour" from Walt's Organic Fertilizer Company cost $5.00. As you can see from the photo, it's gray, not chalky white, and it's a little coarser than the pharmaceutical grade, but it dissolves quickly and works fine. For my buffering needs, I add 1/2 teaspoon (3 grams) at every 20-gallon (76 liter) water change by just swirling it into the water with my hand. By the next morning it has all dissolved. Make sure that your not getting calcium oxide (CaO, also known as quicklime), which is a caustic chemical used in making mortar.